Does it have a cord or use electricity? You can recycle it! Teknix Solutions serves school districts, businesses, government agencies, landfills, and individuals in the state of Kansas. When your device stops working, you stop working. That’s a problem. Teknix Solutions repairs a wide variety of broken electronics, including computers, laptops, smartphones, and more. Looking for a quality laptop, computer, television or phone for less? Refurbished devices are an affordable, better-than- new solution for many people, including students and residential users. From installing a server network to setting up security systems, our IT experts are available to consult or install a variety of home and business solutions. As technology advances and renders electronics and other electrical equipment useless rather quickly, it often leads to these obsolete items ending up in landfills. Some of the devices release toxic chemicals into the land and atmosphere. Mishandled electronic equipment that is not completely and securely destroyed can put your personal information at risk of being put into the wrong hands. We ensure that our certified equipment handlers take every precaution to guarantee the data has been eliminated before further processing. Our facillity in Manhattan has become a leader in dis-assembling, sorting, repairing and reselling electronics. 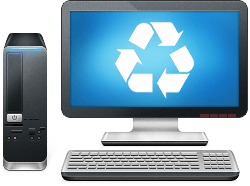 Our process guarantees we can maximize the value of the e-waste and minimize any chances of hazardous materials ending up in landfills.